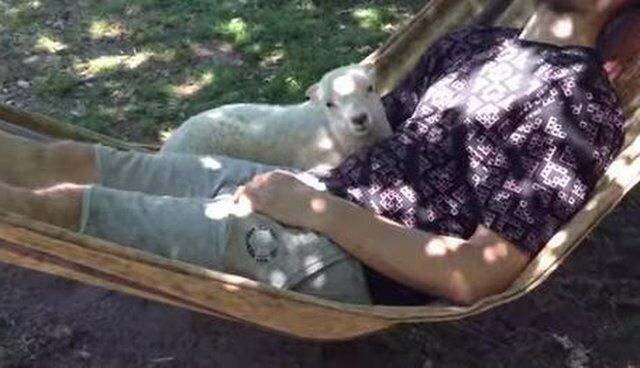 A lamb named Pichu almost didn't survive to live the calm and quiet life he adorably deserves. Tragically, Pichu's mom died during childbirth, leaving him without someone to care for him during his early vulnerable stages as a baby. Because the farmer who owned Pichu's mother did not want to devote the energy to bring him up, he decided his only option was to slaughter the little lamb. Luckily, a relative of the farmer visited Pichu and demanded that the little lamb keep his life. She found Pichu a forever home at Mino Valley Farm Sanctuary in Spain. Only four days old when he came to live at the sanctuary, Pichu is now growing into a happy and healthy ram at two months old. Pichu is so lucky to live with other rescued farm animals at the sanctuary. Pichu has befriended all kinds of animals - including humans. He really loves snuggling, suspended between two tree trunks. Lounge the day away, little lamb. You deserve it. Learn more about Mino Valley Farm Sanctuary and see photos of farm animals who have gotten a new lease on life here. And learn how you can help them here.